Thanksgiving is a time to reflect on what you are thankful for in your life. 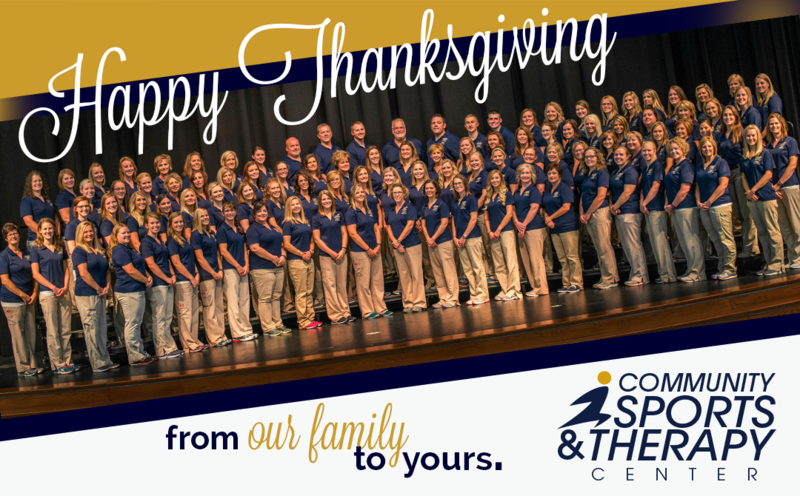 The team of Community Sports and Therapy is thankful for so much. We are blessed to be part of a profession that we truly enjoy and are thankful to have the opportunity to serve our community and change lives in a positive way on a daily basis. Our Patients. We are thankful for our patients and their families. We love and appreciate each and every one of you! Most importantly, we are thankful for having our patients and their families trust in us to help them get back to a stronger and healthier well-being. Our School Kids. Our pediatric staff is thankful they get to spend each day “playing” with children. We are so thankful for all the energy, smiles, laughs, and effort our students put forth each day to improve their speech, language, and social skills. They truly become “our kids” and we are blessed to watch them advance each and every day. It keeps us young and reminds us daily to appreciate the little things in life. Our Team. We are thankful for our dedicated, talented, and hardworking “work family.” As a healthcare worker, your relationships differ than the standard workplace relationship. In the minutes it matters most, trusting your coworkers means everything. Working next to people during long shifts builds close friendships with people who have your same passion for helping serve others. Our Colleagues. Thank you to all of our professional colleagues and specialists that refer patients to our office and allow us to refer patients to them. We are grateful for your knowledge and appreciate your teamwork and camaraderie in bringing our patients into wellness. Our Healthcare Partners. We are blessed to be a part of so many partnerships: Mercer Health, Mercer Home Health, Briarwood Village, Celina Manor, Van Wert Manor, Mercer County and Auglaize County Schools, local athletic teams and many more. Our Community. We are honored to be a part of our local community and to serve patients and their families in the place we are lucky enough to call home. We are thankful every day for the support our community shows us. Technological Advances. Continuing advancement in our systems and the technology we have available to treat our patients globally are always improving. While this can be challenging at times and can throw us a curve ball, it is so valuable to be able to share vital healthcare information with multiple providers in one system and to offer you direct access to your medical records—all to offer you the best care and service possible. From our family to yours, we wish you all a Happy Thanksgiving! this. I will forward this post to him. Fairly sure he will have a great read.